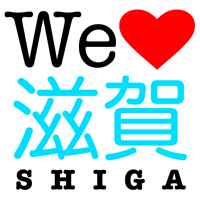 Although Shiga has many local legends and folktales, only a few are nationally famous. And fewer still are in English. 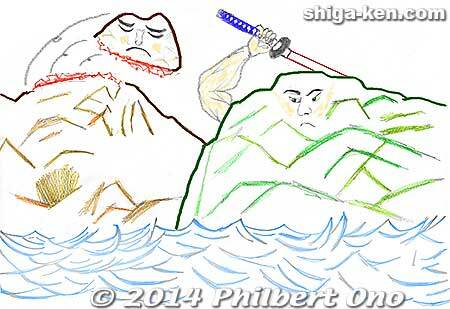 So I’ve started writing English versions of some of Shiga Prefecture’s legends and folktales. One problem is that these stories usually have different sources, versions, interpretations, and adaptations in Japanese. Instead of trying to decide which is the original or better version and translating it, I’ve created my own adaptation in English based on the basic storyline. My first Shiga folktale in English I’m putting online perhaps matches the current rainy season. Enjoy! by Philbert Ono, based on an old folktale. Once upon a time in northern Omi, the great Mount Ibuki-yama stood high and proud. He was the god Tatamihiko (多々美比古命). While the other mountains were often covered with clouds and rain and beaten by the wind, Ibuki-yama stood high and clear above the clouds. But one summer, the clouds were so thick and high that they also covered Ibuki-yama. All the mountains were hidden by dark clouds and rain. He started to look in all directions with a big smile on his face, seeing all the mountains lower than him. In the south, there was Ryozen, a big but lower mountain. Even when he looked west, far across the lake at the Hira mountains, none were higher. But when he looked north, “Whoa, what is that??! !” It was an unbelievable sight. He rubbed his eyes to make sure he was seeing correctly. But he still couldn’t believe it. There was a mountain higher than Ibuki-yama!! “Yes uncle, it’s me, Azai-dake.” Mount Azai-dake was the goddess Azai-hime (浅井比売命). Azai-dake was actually related to Ibuki-yama because they belonged to the same mountain range. “What?? Are you kidding me? I can become taller if I want to! !” Azai-dake was defiant like a rebellious teenager. No matter how Ibuki-yama looked at Azai-dake, she still looked taller than him. He kept bellowing, “Lower yourself!” or “Become shorter!” But Azai-dake only ignored him and didn’t even bother to answer. Azai-dake shrieked, “Hii-EEE!! !” Ibuki-yama swung the sword in one quick stroke and cleanly cut off Azai-dake’s head. Her head tumbled down the west side of the mountain. All the neighboring mountains were shocked to see the rolling head, especially nearby Odani-yama and Yamamoto-yama when the head passed by. “Oh my GOD, what happened to you??! !” The Azai-dake peak kept rolling, GORO-GORO-GORO!!! 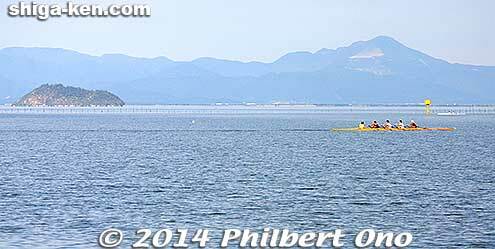 Meanwhile in Lake Biwa, all the fish were also frightened by the big rumbling sound becoming louder and louder. The King of Lake Biwa, Biwako O-namazu (ビワコオオナマズ), ordered, “Hurry everyone! Swim away toward Takashima as quickly as you can!” Takashima was on the opposite shore of the lake. Some moments later, BA-SHAAAAN!!! ZA-BUUUN!!! Azai-dake’s head splashed into Lake Biwa. It rolled through the lake and left a muddy, brown trail in the blue water. At the same time, monster waves rippled across the entire lake and even sloshed against the white sands of Omi-Maiko. The green pine trees on the white beach almost drowned. Azai-dake’s head finally stopped in the middle of northern Lake Biwa. The top part of the head stuck out from the water and became a small island. 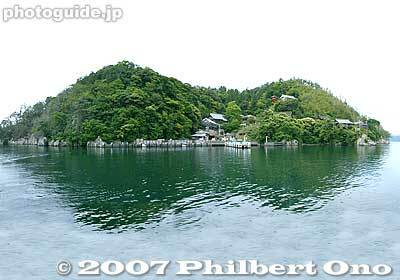 Since Azai-dake’s head made bubbly sounds like Tsubu-tsubu-zubu when it went through the water, the island was named “Tsububushima” (都布夫島). After the water became calm and clear again, King Biwako O-namazu, who was a Lake Biwa Giant Catfish, inspected Tsububushima underwater. “This is a great place for fish to live! This steep and rocky underwater habitat is perfect.” Many happy fish like funa carp, catfish, and eels then started living around Tsububushima. Bamboo also started growing on the island, making it green. The island was then renamed “Chikubushima” (竹生島), meaning “Bamboo Birth Island.” Although Azai-dake died, she brought forth new life and new habitats. Chikubushima and Mt. Ibuki as seen from Imazu, Takashima. Mt. Kanakuso-dake and Mt. Ibuki as seen from the Hokuriku Line in winter. Mt. Ibuki (伊吹山) is Shiga’s highest mountain in Maibara at 1,377 meters. Azai-dake is Mt. Kanakuso-dake (金糞岳) in Nagahama, northwest of Mt. Ibuki. It is Shiga’s second highest mountain at 1,317 meters and part of the Ibuki mountain range. Chikubushima has a circumference of 2 km. If we add Chikubushima’s 197-meter height to Kanakuso-dake’s height, Kanakuso-dake would indeed be higher than Mt. Ibuki. Chikubushima is home to Hogonji Temple first built in 724 as ordered by the emperor to worship Benzaiten, the goddess of everything that flows: Water, rivers, music, etc. Belonging to the Shingon Buddhist Sect (Buzan School), Hogonji is one of Japan’s three major spots worshipping Benzaiten (other two being Itsukushima Shrine and Enoshima Shrine). Tsukubushima Shrine also worships Benzaiten as well as the Dragon God and Azai-hime. Many famous samurai, such as Oda Nobunaga and the Azai Clan, worshipped at Chikubushima since they believed Benzaiten had the power to destroy their enemies. Chikubushima is easily accessible by boat operating daily from Nagahama Port, Hikone Port, and Imazu Port. Boat schedule for Nagahama and Imazu Ports here and for Hikone Port here (in Japanese). * This English story is my adaptation of the original Japanese folktale, not an exact translation. This means certain parts of this story are figments of my own imagination. The original folktale appears in the Omi-no-Kuni Fudoki (近江国風土記) ancient chronicles of Omi Province (Shiga Prefecture). * The drawing above was created by a close, young relative of mine. * I welcome submissions of artwork depicting scenes from this folktale. The best ones will be posted on this page and credited to the artist.